← Do you know an addict? 1. 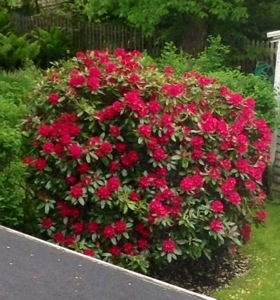 My neighbour’s spectacular rhododendron is brightening up our side view. 2. The slug collecting has begun. 3. Baths have become mandatory every night (see above). 4. The school bags are being held together by spit and a prayer. 5. I find myself barbecuing rain or shine. 6. The kids are complaining that it’s still bright out when they’re going to bed. 7. The hockey detritus in the porch has been replaced by cleats and shin pads. 8. Muddy handprints can be found on every surface of the bathroom. 9. Skinned knees have tapped out our band-aid supply. 10. Facebook tells me it’s hot in Toronto. 11. The sunscreen battles have begun. It might sound like I’m complaining, but I’m not. It’s just that the kids are tired of school and I can hardly stand to pack another recess snack. In short, we are ready for summer. The Freezies are solid – so bring it on! This entry was posted in General, Lists and tagged Family, Funny, kids, school, summer. Bookmark the permalink. But I’m so coooooolllllddd, Stephanie!!! Hey, I didn’t list “It’s warm in Halifax” as one of the signs!